If you’re planning your Florida holidays, Orlando is simply awesome. There's no other way to describe it. It's the ultimate destination for young and old, kids or couples, and there really is something for everyone. On an Orlando holiday, you can take your pick from mind-blowing theme parks; fantastic attractions; superb shopping; lip-smacking restaurants; top-notch golf and amazing outdoor activities. Plus we can offer you the perfect place to stay, whether you are looking for a themed hotel, private villa, boutique resort, or a budget-friendly hotel. Oh, and the beach isn't far away either - Orlando holiday deals genuinely do have it all. Sounds great so far - but what about the weather? Well...that's awesome too. Orlando has a sunshine record second-to-none, with an average year-round temperature of 22.5 ⁰C getting up to 30⁰C in summer, and around 20⁰C in winter. That means everything is open all year round, and you don't have to worry about walking around Walt Disney World Resort in Florida in an icy wind cold enough to freeze Mickey's ears off. The endless sun leaves you free to do what you want. Discover the magic of Walt Disney World Resort in Florida. Adrenalin addicts can get all the thrills they can cope with at Universal Orlando Resort™. If the heat gets too much there are some amazing water parks to cool off in, such as Universal's Volcano Bay™ water theme park. Animal lovers can get up close to all kinds of creatures at SeaWorld, Discovery Cove, or Disneys Animal Kingdom Theme Park. Shopaholics have some mammoth malls to work their way through. And if it's a decent round of golf you're after, then Orlando's greensward just can't be beaten. There's more fun to be had once that dazzling sun eventually dips below the horizon. Orlando's diverse collection of high quality restaurants and chefs has created a vibrant culinary scene that's receiving national recognition. Plus there's shows, clubs, cocktail lounges, comedy joints and more - all of which ensure that Orlando holiday deals just can't be beaten. Why not take a look at the other Florida Holidays destinations that we offer, like Disney holidays, Miami Holidays or Florida Keys? You can also explore our other popular USA holiday destinations including Las Vegas Holidays, New York Holidays, San Francisco Holidays, Los Angeles Holidays and Hawaii Holidays. 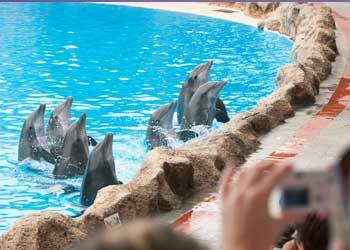 Sea World and its sisters Discovery Cove and Aquatica have a whole host of watery treats in store. These eco-adventure parks offer the chance to discover marine habitats; get a good look at different animals from polar bears and penguins to killer whales; swim with dolphins; and pick up some speed on some awe-inspiring rides and slides. Take a small step from Orlando and make a giant leap in outer space experiences by visiting the place where NASA has launched its rockets since 1969. See actual spacecraft, enjoy an encounter with an astronaut, watch mind-boggling footage on the giant IMAX screen and even get up close to the launch pad. Whether you're into parks, shopping, food , films or night-life, this strip is at the heart of the action. Six major theme and water parks have their home along I-Drive, plus there's cinema complexes, bowling, night-clubs, theatres, over 150 restaurants and nearly 500 shops - including the huge and much-loved Simon Shopping Destinations Premium Outlets mall. Think Orlando, think theme parks. There's an embarrassment of riches in the immedite area, and something for every age. Take your pick from DisneyWorld, with its Magic Kingdom, Epcot Center, Hollywood Studios and Animal Kingdom. Or for more thrills and adventure visit Universal Orlando Resort™ with its three theme parks: Universal's Islands of Adventure™, Universal Studios Florida™ and Universal's Volcano Bay™ water theme park. When you want to cool off from the hot Florida sun, head to one of Orlando's whacky water parks, where you can try out some stupendous slides and rides. DisneyWorld has two water parks - Typhoon Lagoon and Blizzard Beach; there's SeaWorld's Aquatica, complete with marine animals; and Universal's Volcano Bay water theme park. Within walking distance to shopping, dining and entertainment, this lively hotel provides family friendly accommodations in the heart of Orlando’s International Drive. Our wide range of Orlando homes are the perfect choice for a fully flexible holiday, offering unbeatable value for money, all the home-from-home comforts you would expect. Relax as lush gardens, warm breezes and the distant sound of steel drums beckon. A lively shopping bazaar, food court and two lounges give this resort the color of the Caribbean. A great value for families and active travelers looking to explore Orlando, Rosen Inn International provides a nice blend of traditional accommodations and friendly service. Spanning over 90 acres of beautifully-manicured grounds, soothing fountains and sparkling pools, this hotel appeals to families and active travelers seeking an unforgettable holiday. Enjoy vibrant, retro-style rooms and suites, with stellar recreation from a cool lazy river and pools to bowling and more. An "Official Universal Orlando Partner Hotel", Doubletree Hotel at the Entrance to Universal appeals to families, active travellers and groups seeking a fun-filled stay in sunny Orlando. Sheraton Lake Buena Vista Resort is the recently reinvented Orlando resort centered upon a dramatic pool playground and located adjacent to the excitement of Downtown Disney. 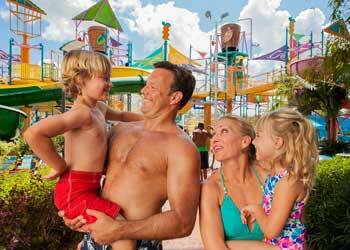 Soak up the tropical atmosphere and sit poolside while kids splash and play in Orlando. Packed with slides, rides and pools, the water park provides non-stop fun for everyone. Spread across 53 lush, tropical acres of stately palms and fragrant Bougainvillea, guests can step into a world of cascading waterfalls, lush landscaping and classic hospitality. Live like a rock star and savour the perks of rock ‘n’ roll royalty with impeccable accommodations, laid-back luxurious style and show-stopping service. Disney's All-Star Music Resort is a Disney Value Resort hotel featuring giant icons that pay homage to classic music genres—including Broadway show tunes, country, jazz and rock n' roll. This fabulous holiday combination starts as soon as you arrive in New York City. Shop in Times Square, relax in Central Park and see the world-renowned sights it has to offer. Here you could stay 2 nights before heading on to Orlando where you can spend the remaining 5 nights exploring the huge variety of parks on offer. Enjoy Walt Disney World, SeaWorld, Universal Orlando ResortTM and more as you savour America's theme park capital! Start your unforgettable twin centre holiday with a stay in Las Vegas, the 24-hour nonstop playground of fun and excitement! See a show or roll the roulette, the choice is yours! Here you could stay 3 nights before heading on to Orlando. Enjoy the many theme parks Orlando has to offer from Walt Disney World Resort to SeaWorld or Universal Orlando ResortTM, there is endless possibilities for fun and excitement for the whole family. Combine the thrills and spills of America’s theme park capital with a tropical getaway on the Caribbean island paradise of the Bahamas on this USA and Caribbean twin centre holiday. Begin your trip with a flight to Orlando where you’ll stay within easy reach of Walt Disney World Resort®, SeaWorld Orlando, Universal Orlando ResortTM and all the area’s great attractions. From here, it’s a short flight to Nassau, where you’ll have plenty of opportunity to relax, soak up the sunshine and top up your tan. This amazing holiday combination starts as soon as you arrive in fabulous New York City. Shop in Times Square, relax in Central Park and see the world-renowned sites that the city has to offer. Next up is the thrilling theme parks and entertainment of Orlando, where your hardest decision is which park to visit first! Then end your holiday in vibrant Miami with its iconic South Beach where you can stroll around the Art Deco District, sit on a terrace on Ocean Drive for people watching and get your shopping fix on Lincoln Road. Enjoy a 14-day fly drive trip starting in Orlando and ending in Miami. Spend time in Orlando enjoying the various theme parks and attractions before heading to beautiful Palm Beach for some down-time. After a few days of relaxation head to vibrant Miami before driving south to explore the beautiful Florida keys. Return to Miami to drop off your rental car and fly home. Spend time in Orlando enjoying the various theme parks on offer before driving to the coast and spending time in the popular resorts of St Pete & Clearwater where you can enjoy a relaxed atmosphere, amazing beaches and lots of entertainment. Our recommended 12-day fly drive holiday showcases some of the best sights of Orlando, the Gold Coast and Tampa Bay. Starting off in Orlando where you can find various theme parks and attractions before heading to Daytona Beach for beachside fun and frolics. Move on to Cocoa Beach, where relaxation and space adventure awaits. End your fly drive adventure in Tampa Bay, a buzzing Gulf Coast City where you can top up on shopping, outdoor adventure and true Floridian nightlife before heading home..
A 12 day self-drive trip starting in Orlando and ending in Fort Myers. Spend time in Orlando enjoying the various theme parks on offer before making your way to Fort Myers where you can take advantage of beautiful beaches, family attractions and outdoor activities. Take advantage of the “14 days for 7 Disney Park Ticket” - £263 per person. Get the Universal OrlandoTM 3 Park Explorer Ticket for the price of a 2 Park Explorer Ticket! Valid for admission up to and including 31 December 2019. Terms and conditions apply. Save up to 60% on over 330 designer and brand name outlets. Hire a car and take a drive to the Kennedy Space Centre. Pre book this great value tour from just £65 per person. Arabian Nights Dinner show - From only £35 per person. Miami Daytrip and Florida Everglades Airboat Ride – from only £79 per person. Saint Augustine Day Trip from Orlando – from only £45 per person. From Disney’s Blizzard Beach Water Park and Disney’s Typhoon Lagoon Water Park, to SeaWorld, Aquatica and Universal's Volcano Bay™ water theme park. if you can’t choose between these great waterparks, why not purchase an Orlando Flex Ticket – Prices start from £209 per person. With the kids off school for six weeks, it’s a great opportunity to take the family on that dream Florida holiday. Florida’s tropical climate means it’s warm all year round but especially so in August. Find out how to make the most of what Orlando holidays in August have to offer from the stunning scenery and wildlife to culture and fine dining, and not forgetting theme parks. There are even some tips on what to pack. Florida is known as the “Sunshine State” and you are surely going to want to spend some of your Florida holidays soaking up the rays on the beach. There are so many world-class beaches to choose from. Here we give you the lowdown on famous names like Florida Keys, Daytona, and Palm Beach, as well as plenty of info on less well-known locations that could turn out to be your favourite sunspot. If you’re planning your Orlando holidays, for a week or two weeks, you know there is so much to do you can’t fit it all in. Some theme parks can take more than a day to get around! Here’s a handy guide to the best attractions, from the most obvious, such as Walt Disney World and Universal Studios, to a few you maybe hadn’t considered, or might not even know to exist. One thing is for sure, you won’t be short of Florida holiday ideas after reading this. Orlando seems almost synonymous with Walt Disney World, and a visit to Florida that didn’t include it on the itinerary might seem a bit strange, however, there is so much more to Orlando than just theme parks. Here we take a look at some of them, including dining out, cultural visits, sporting activities both participating and spectating, and beautiful scenery. There’s something for everyone on your Orlando holidays. Visit Florida; every type of holiday in one destination. With some of the world’s best theme parks and finest beaches, year-round great weather, and once-in-a-lifetime opportunities; Florida holidays can keep everyone happy, from toddlers to pensioners; whether you want to laze about and be pampered, or dash off chasing wild thrills and adventure. This article gives you a taste of some of the best experiences the Sunshine State has to offer. Check it out as well as the other articles here and make sure you get your Florida holidays off to a great start. Roundtrip starts from only £28 per person. Shop ‘til you drop at Orlando Premium Outlets®! Offering two distinct and incredible outlet shopping locations, Orlando Premium Outlets® feature 330 designer and brand name outlets, offering savings of 25% to 65% daily.